Aqua, glycerin, cyclopentasiloxane, cyclohexasiloxane, dimethicone, dimethiconol behenate, sodium citrate, PEG 18 dimethicone, panthenol, zinc gluconate, madecassoside, dimethiconol manganese gluconate, sodium hyaluronate, disodium EDTA, copper gluconate, citric acid, plysorbate 20, capryl glycol, methylparaben. 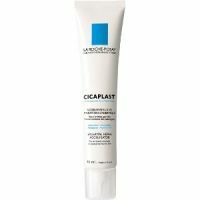 Found a similar moisturizer to this one called Cicaplast Baume B5 and bought it with the Effaclar wash. I was told by a saleswoman that the combination would clear my skin and scars, leaving my skin extra smooth. The first couple days I actually believed it was working, then it completely flopped. I gave it 2 weeks before I could not bare it anymore and threw it in the back of my closet because of how lifeless and dry it left my skin- specifically the moisturizer. This was in the summer. Last night, I couldn't find my night cream and was too tired to care about finding it, but my skin was begging for some moisture, so this came to mind. I figured it would do no harm, since my first days the first time I used it were promising. Biggest mistake ever. Today I woke up and my face hurt. I tried washing it off and applying night cream in hopes it would recover, but it didn't. My nose was super dry and red, and I even put on vaseline. Nothing worked to restore it. I feel like every drop of moisture was sucked out of my skin, and I normally have very oily and acne-prone skin, so that says a lot. I'm not sure if there's a chemical in there that completely irritated my skin- the tube doesn't list the ingredients- but this is worse than I even remember. Tonight I looked in the mirror and all the skin on my nose and chin was dry and tiny white heads had surfaced where all my sebaceous filaments were. Not sure what is going on, but my moist skin has completely shrivelled into a dry, redness and I have no clue what to do but moisturize heavily. Not with this "moisturizer", though, that's for sure. -Cheap -Protects skin rather than damages it -Doesn't do much Surprised to even find this here. Hasn't affected my scars in any way, though I have been using this for an entirely different purpose. Don't bother with this.